Iceland lowered its aviation alert level to orange from red Sunday, saying there was no sign of an imminent eruption at the Bardarbunga volcano. Iceland lowered its aviation alert level to orange from red Sunday, saying there was no sign of an imminent eruption at the Bardarbunga volcano. 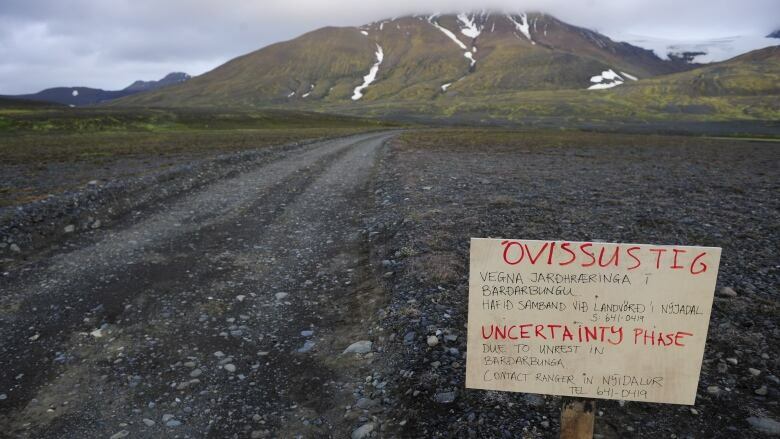 And scientists at the Icelandic Meteorological Office said their announcement Saturday that the volcano had experienced a subglacial eruption was wrong. However, the office cautioned in a statement that seismic activity at the volcano, which has been hit by thousands of earthquakes over the past week, was not slowing, and an eruption remained a possibility in coming days. Two earthquakes measuring greater than 5 in magnitude — the biggest yet — shook the volcano beneath Iceland's vast Vatnajokull glacier early Sunday. The Met Office recorded earthquakes of 5.3 and 5.1 in the early hours. Iceland had raised the alert for aviation Saturday to red, the highest level on a five-point scale, warning that an ash-emitting eruption could be imminent. An orange alert indicates "heightened or escalating unrest with increased potential of eruption." After the alert was lowered, aviation authorities lifted a no-fly zone that had been imposed for 185 kilometres by 260 kilometres around the volcano. A 2010 eruption of Iceland's Eyjafjallajokul volcano caused a week of international aviation chaos, with more than 100,000 flights cancelled affecting more than 10 million people, and costing $1.7 billion US. Aviation officials closed Europe's air space for five days out of fear that volcanic ash could harm jet engines. Britain's National Air Traffic Service said it was monitoring what it called a "dynamic situation" but was expecting normal operations Sunday. "Observations show that a sub-glacial eruption did not occur yesterday. The intense low-frequency seismic signal observed yesterday has therefore other explanations," the Icelandic Met Office said. The office had therefore decided to move the aviation warning code from red to orange, it said, but since there was no sign the seismic activity was slowing down, an eruption could still not be excluded. The national police commissioner said separately that all restrictions on aviation had been cancelled. Airspace of 140 by 100 nautical miles above the volcano had been closed to aircraft on Saturday. However, restrictions on roads and evacuated areas in the region remained in effect, it said. Authorities were moving away from emergency footing though they remained on alert. There have been thousands of small earthquakes over the past week at Bardarbunga, which is Iceland's largest volcanic system and located under the ice cap of a glacier. It is in a different range to Eyjafjallajokull, which erupted in 2010. The Met Office said on Sunday a magnitude 5.3 earthquake at 5 km depth had struck after midnight while another, with a magnitude of about 5, had occurred some five hours later. "These are the strongest events measured since the onset of the seismic crisis at Bardarbunga and the strongest since 1996," the office said. Brussels-based aviation authority Eurocontrol said that as soon as the volcano had erupted, the Volcanic Ash Advisory Centre in London would produce a regular forecast about the levels of volcanic ash in the atmosphere. Based on this forecast, civil aviation authorities may issue a notice but it was the responsibility of individual airlines whether they would operate and how they would adapt their flight schedules, Eurocontrol said.